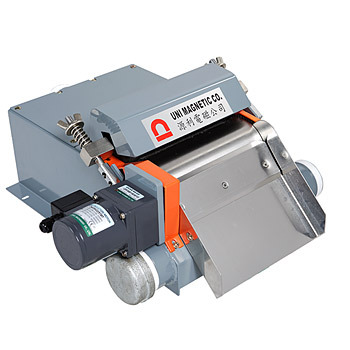 We provide Coolant Filtration System, Magnetic Separator and Super Easy Scrape Magnetic Separator with high quality. 1. Taiwan Coolant Filtration Supplier. 2. Ferrous contaminant can be attracted, squeezing, and discharged automatically. No filter media consumption in the coolant filtration system. 3. Use rare earth magnets, whose magnetic force is 8 times stronger than Ferrite magnets. 1. It can attract contaminants with weak magnetic force, such as cemented carbide, carbon. 2. It works excellently with oil coolant. Second filtration process is not necessary. 3. No magnetic force near scraper, so contaminants are easy to be discharged. 4. You can adjust the upper scraper while it is wearing. 1. Capacity: 20, 30, 40, 60, 80, 100, 150, 180, 240,300L/MIN. 2. Stainless Steel frame. Motor's position can be on either left or right side. 3. Position of fluid outlet is on left, right side, or bottom.